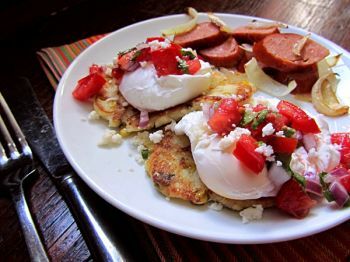 While missing some elements of a classic Eggs Benedict, masa cakes and fresh garden salsa make this version light and flavorful. I am not a morning person. Sleep usually evades me until the wee hours, and often I am just getting comfy when the alarm goes off. In my perfect world there would never be morning alarms, but there would always be breakfast. I am absolutely a breakfast person. At home, my breakfasts are quick and easy. I fall prey to the snooze button, morning belly rubs and snuggles with the pups and last minute chores. By the time I hustle through a shower, splash on some makeup, try on half my closet and pull a flatiron through my hair, I am already behind. A quick cup of yogurt with some fruit and Brown Sugar Granola or a slice of toast slathered with peanut butter and honey are my go-tos. However, when I travel, I love going out for breakfast and brunch. If Eggs Benedict is on the menu, I won't read any further. There are no words for the depth of my love for poached eggs layered with a multitude of savory ingredients and topped with a rich sauce. I am drooling at the thought. Classic Eggs Benedict is a toasted English muffin topped with a slice of Canadian bacon, a poached egg and drenched in Hollandaise sauce. During my travels, I have sampled a garden version of this breakfast with a thick slice of ripe and juicy tomato and baby spinach between the egg and English muffin. In New Mexico, the muffin was swapped out for cornbread topped with sausage, and the eggs were ladled with green and red chile sauces. There was once a Tuscan option with prosciutto and drizzled with balsamic vinegar. Smoked Salmon Eggs Benedict has drawn me in, as has Crab Cake Eggs Benedict served over bruleed potatoes. I have even had a southern version with biscuits, andouille sausage and sautéed peppers and onions, topped with spicy milk gravy instead of Hollandaise. There isn't an option for this delicious meal that I won't try. Recently, I cooked some masa cakes, layered fresh-from-the-garden salsa on my poached eggs and crumbled queso fresco over it all. While missing the sauce of traditional Eggs Benedict, this was a light and flavorful riff of the dish. Some grilled sausages and onions on the side filled my plate and made a breakfast worth waking up for. To make the salsa, combine the tomato, onion, jalapeno, cilantro, lime juice and salt (to taste) in a bowl. Set aside. Preheat the oven to 200 degrees F and bring a deep pan of water to a simmer. To make the masa cakes, heat milk and butter together in a small pan until warmed and combined. In a bowl, mix corn flour, queso fresco, fresh corn kernels, green onions, salt and sugar. Add the warmed milk to the corn flour mixture and stir to make a soft dough. Divide the dough into 8 portions and flatten each into disks. This can be done between 2 sheets of parchment paper or by hand. Heat olive oil in a large skillet and fry the corn cakes in batches until crisp and golden on both sides. Keep the prepared corn cakes warm on a baking sheet in the oven while poaching the eggs. Add vinegar to the large pot of simmering water. Poach the eggs (1 or 2 at a time depending on size of pot).